Once upon a time, there was a kingdom in which lived a beautiful princess. She was a sweet soul, kind to all and was thus loved by the whole of the kingdom. Several young men had fallen helplessly in love with the princess, but unable to enter the castle, all they could do was send her letters of their affection. However, to their dismay, they found that letters from just anyone would not reach the princess. So the young would-be suitors set themselves on finding allies among the castle’s servants, so that they might deliver their letter to the princess personally. Love Letter Kanai Factory Edition is based on the original card mechanic rules and features the charming art and graphics from the original game first published in Japan. The Kanai Factory Edition is a limited release by AEG and will only be available while supplies last! 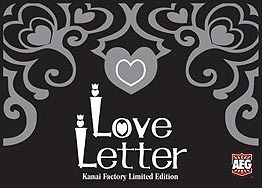 Love Letter Kanai Factory Edition features two exclusive promo cards only available in this release.